A chain of small decisions made it yet another short-mileage day today. For breakfast I went to this small place in Hot Sulpher Springs, called The Sportsman’s Cafe, and had biscuits and gravy instead of the usual pancakes. The woman that worked there was talking to a regular customer. I wasn’t paying much attention, because I think I was writing up the previous day’s journal entry. The woman suddenly asked me, “What do you do?” like for work. It turned out that the girl who works weekends at the restaurant just quit, and here I was all of a sudden considering stopping to work here for a week. It would have been ideal – free camping in town, an easy opportunity for money that came to me by chance, doing the only vocation I’ve done all my life, and being able to live in a small town in my favorite state thus far. Not to mention, a full week off the bike at over 7,000 feet may render me into Superman Cyclist when I get back into the saddle! It turned out that the restaurant didn’t need any help until Friday. Today was Monday. It wouldn’t have been viable if I had to wait around until then, but since I was stuck on the idea, I looked around town for other work I could do during the week. I couldn’t find anything, and gave up on it. Back at camp, I learned that my hitchhiker friend had a job lined up – bar tending at the only bar in town. This sealed the deal for me. I think two vagrant squatters at the same time may have been a bit much for this small community, so I told my friend about the cooking opportunity and hit the road. In the short distance of about ten miles I came to the next town, Granby, slightly off route. I technically didn’t need anything in town, and could have just blown right by it, but I thought they’d have a library there. It had a population of 1,500 – three times that of Hot Sulpher Springs. So I went and they had a nice new library with an unlimited internet time limit, as long as nobody was waiting, and I uploaded the latest pictures and entries. When I left the library, I found that the weather had taken a turn toward the more ominous. Rain clouds and visible lightning strikes were headed my way. I rode out of town, thinking that my northbound route could beat the storm, and made it two miles to the junction with route 125 where I observed the sky, making me think again. There was a “wildlife viewing area” here by a small lake, set up like a highway rest stop, so I took shelter there and decided to wait it out. I tuned in to the radio and relaxed, hearing neil young comes a time, gordon lightfoot sundown (I love that song), the guess who no time, some beach boys, and joe cocker. I also figured out why the radio was giving me trouble before. I had it clipped on to the front of my shorts, and it appears that dried salt from my sweat was getting into the electrical parts, causing it to malfunction. Nice. I ended up waiting around under this shelter for almost two hours, only to see the skies grow darker as rain continued to fall. It was a cold front that moved through at a slow crawl. Great. 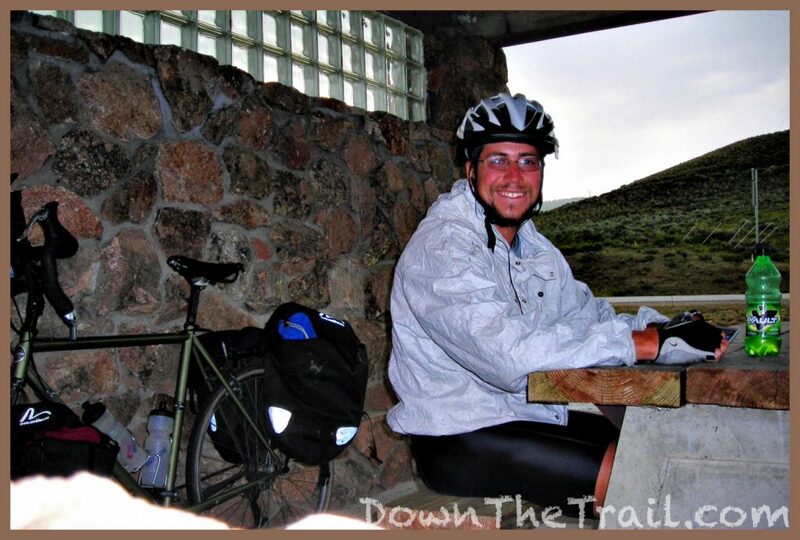 The TransAm Trail goes ten miles from here on route 125 up to Willow Creek Pass, crossing the Continental Divide again. It’s a total of 50 miles to the next substantial town, Walden. I can handle riding in chilly, windy conditions… but especially over the pass, I figured why should I if I didn’t have to? By this time it was 4:30pm, and I went back to Granby for the night. Slacker. Tonight for dinner I went to a restaurant with an assortment of international food (Italian, German, etc. ), and had a large pizza. The server brought a little squeeze bottle of honey with it. I was like “What’s this all about?” The waitress told me the honey is supposed to be for the crust. I tried it and of course it tasted great – it’s honey! You ought to try it next time you have pizza with a doughy, soft crust. I sat and ate the whole large pizza, astonishing the waitress. “I’m traveling on my bike – I burn a lot of calories,” I explained, and pointed out the tan lines from my gloves. Life is good.